For wildly different reasons, the last two games have given hope to fans who want to see this offense click after weeks of getting stuck in neutral. In New York, it was plenty more play-action passing and we saw plenty of Dez Bryant sitting in the slot and being moved all over the field. That was a welcome change that was long overdue. Then, 4 days later against the Oakland Raiders on Thanksgiving Day, we saw the team commit to their zone running mix with 11 personnel for an extended period of time that left the Raiders guessing and undermanned at the line of scrimmage. Further, there were multiple tight ends on the field for nearly the entire 1st half which is fine – unless they are never going to force the Saints to change their coverages. They locked down on Bryant and never had to adjust to the Cowboys. There was no creativity, no rhythm, and seemingly, very little logic put into the play-calling. Given the severity of the situation, if I am Jason Garrett, I realize the final 6 games will decide my job future in Dallas and would have to go get the play-calling duties back after a stinker like this. Bill Callahan is a respected coach and a guy who knows what he is doing and he shouldn’t be blamed entirely for all of this mess. But, when you are Garrett, and this is your dream job and you don’t want to know what being fired feels like, then your next 6 games could determine the rest of your career. The historic lows that were seen on Sunday from this offense and the season-long pathetic performances on 3rd Downs seem to demand instant attention and desperate measures. I would never argue that Garrett has the answers, because if he did, Callahan would not be here in the first place. But, if was Jason Garrett, I would definitely be grabbing that call-sheet back for the stretch run. So, I believe that about the time I wrote that, it (coincidently) happened. Garrett, as far as I can tell, has been calling plays for 2 straight games and conveniently – for his sake – things have made far more sense. Again, I hesitate to say that he has all the answers and that this was a long time coming, but I will be quick to remind people that most of what they have run would all fall under the heading of “Jason Garrett ideas” and we must recognize the huge amount of bad that must go with the good over the last several years. That said, we can’t fix 2011 or 2012 anymore. And after 10 games of 5-5 football and a seemingly clueless offense (aside from the Denver game which must be called this season’s version of Baltimore 2012 – a full aberration game), if Garrett has introduced obvious strategies like play-action and 11 personnel back into the mix, well more power to him and his coaching future. Before we get to what I really enjoyed in the Oakland game, let me answer the question that I have fielded plenty this weekend, “why did the Cowboys not run play-action on Thursday?” – especially after it worked so nicely against the Giants. Easy. Play action is a full deception play that requires a bit of faith – like a naked bootleg. That is, if your opponent thinks you are running it and you really are, you are in trouble. Play-Action is easily taken away by the opponent if they catch you in your lie, because they simply order their linebackers to keep coming. Play-action fakes work because you are luring a linebacker forward with the fake and then as he attempts to recover, you throw it right over his head. He is in no-man’s land. Well, the remedy for this if you are a defense is to tell your linebackers to keep sprinting to the QB (rather than hit the brakes and back off) and this leads to compromising your pass protection badly. On Thursday, that happened and Romo got crushed on a Nick Roach sack in first quarter because the Raiders were determined not to fall for that trick and play-action went into the garage until they play a team that is not going to play it so aggressively with a 50% blitz rate like the Raiders. Play action is perfect against most teams that try to play 7-8 man pass coverages, but the Raiders weren’t doing that at all. They were bringing the heat. 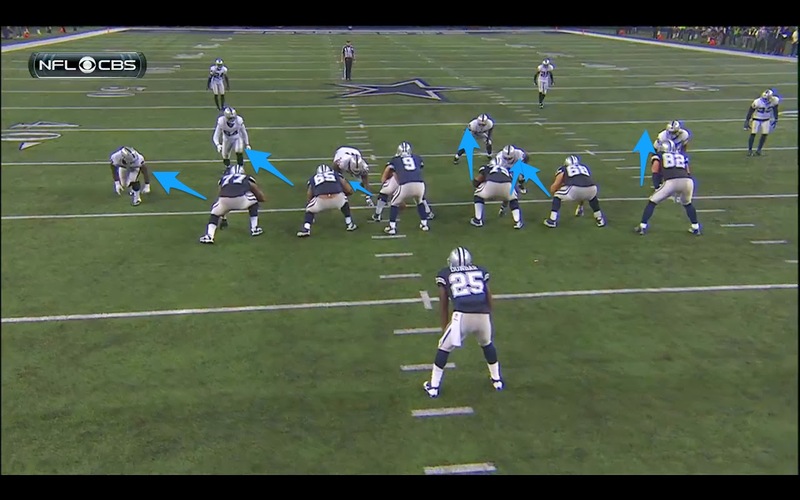 Let’s look at what I did like from the Cowboys on Thursday, which was a determined running attack out of 11 personnel. This means that they take off the multiple tight end attack and replace it with 3 WRs and then run a balanced offense from that attack, rather than a heavy-pass offense. 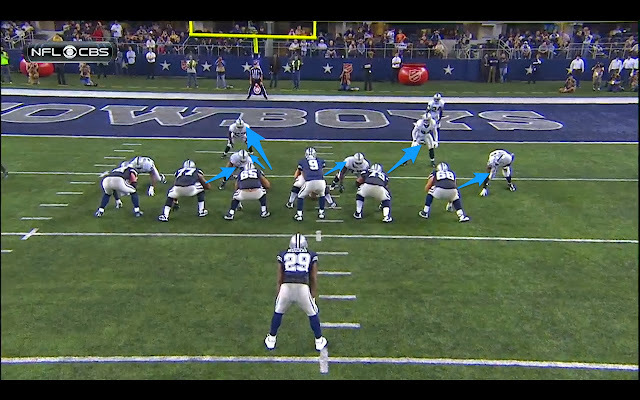 It may seem like a subtle change, but it turned the game because the Cowboys had a front they could run against (6 bigs, nickel defense) rather than what 12 personnel brings (7 bigs, 4 DBs). Then, they get under center and run the ball and allow their big boys to win their battle and get a smaller RB like Lance Dunbar out into space where he can hide behind a big guard. Above, see the assignments for zone left. I like this in 11 personnel and with Dunbar because he seems far more likely to plant his foot and cut early in the play, rather than Murray who always seems to head for the sideline and try to turn the corner at the boundary. But, notice, 4 DL, 2 LBs in this grouping against 11 personnel. So, 6 blocking 6 which you always like and the safeties are deep. 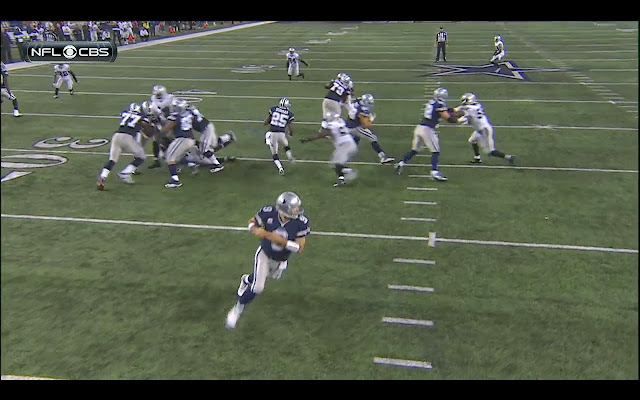 In fact, this could be a run/pass option for Romo who reads the safeties and decides the option at the moment of truth. Notice the combo block on the 3 technique who is shading the outside shoulder of Bernadeau. That is Free’s man for this play to work, because Bernadeau can reach the LB behind him, but Free cannot. 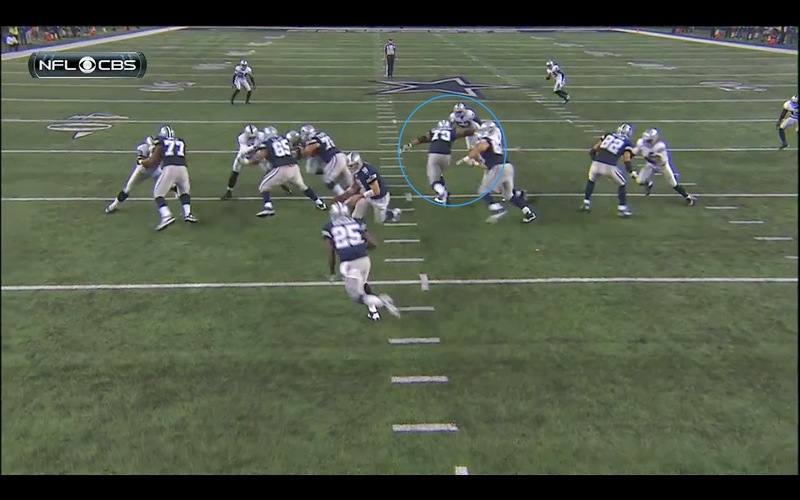 So, Bernadeau must push the DT over to Free, allowing Free to turn his body to the inside. When Bernadeau gets that block to Free, he then, must go get Nick Roach, the LB. This single block is the key to this entire play as long as everyone else just doesn’t lose. 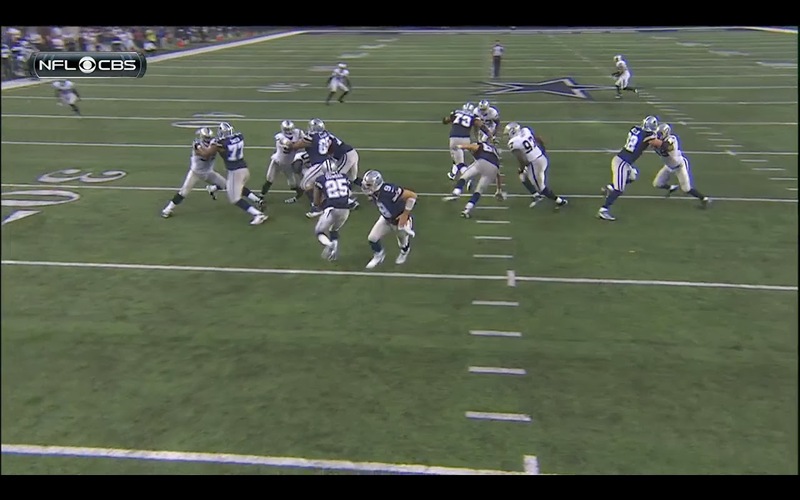 Above, see Frederick just mauling his guy out of the path, with 65-Leary and 77-Smith both in a fine spot. Dunbar can already see where he is going because Free has crossed the face of that DT and 73-Bernadeau is already getting to the LB before Dunbar touches the ball. Perfect. 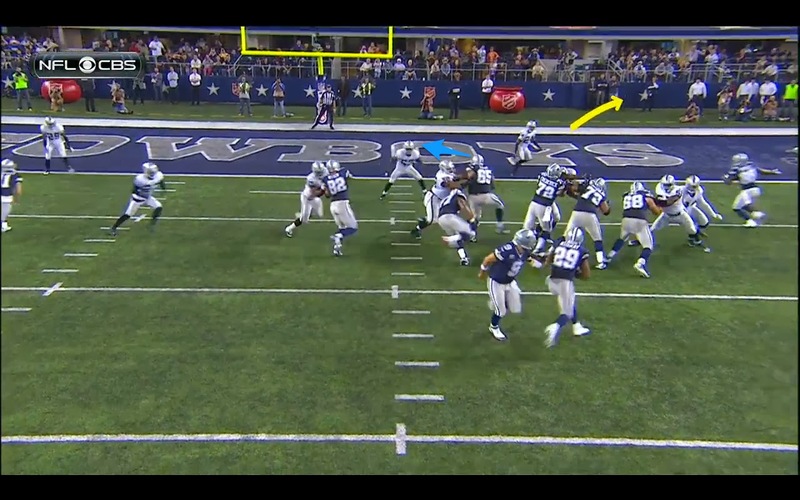 Now, like I was saying above, Dunbar must plant the foot and go inside rather than take it out past Tyron Smith to find the best hole. This sounds obvious, but instincts seem to always tell DeMarco to run to green space and sometimes that is exactly wrong. Hit it up inside if there is a crease and trust the line to get to their marks. Free is stumbling, but still in the way of his guy. Everyone else is fine. Now, as Dunbar hits the hole, look at Bernadeau just bulldozing his man back. Perfect work here. Above, see 24-Woodson looking at Dunbar spring into the secondary. 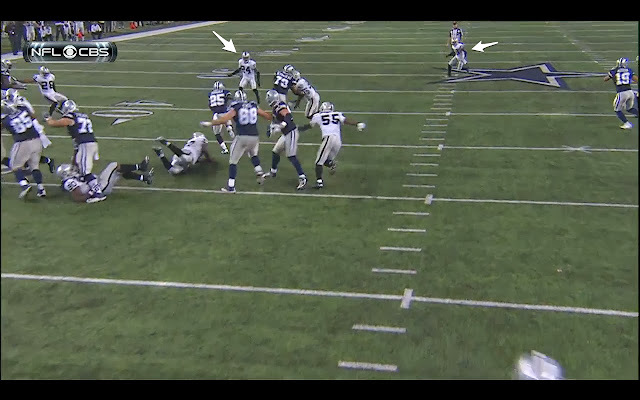 Woodson thinks he has an angle, but Dunbar is going to use Bernadeau as a way to lose both safeties and run for 45 yards. Great job by everyone here. Check the gif below to see Dunbar’s cutback at the 39 yard line. OK, so you just saw this play above, but this one is flipped. So, the LG, 65-Leary is the man with the backside, combo block on the zone right. 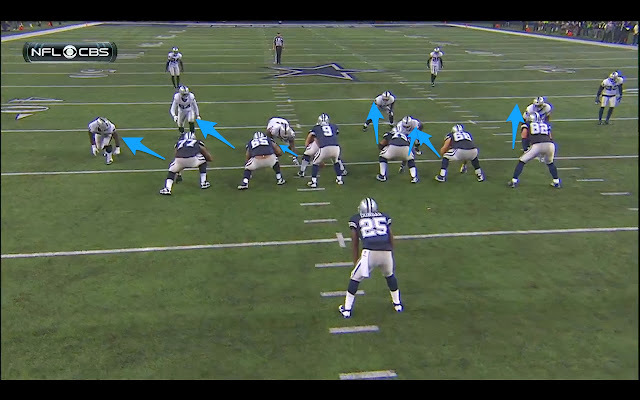 Again, 6 in the box because the Cowboys have 11 personnel on the field and forced Oakland into nickel. Leary must get the 3 technique over to Tyron, and then go dig out the middle linebacker on his own. Here we go. 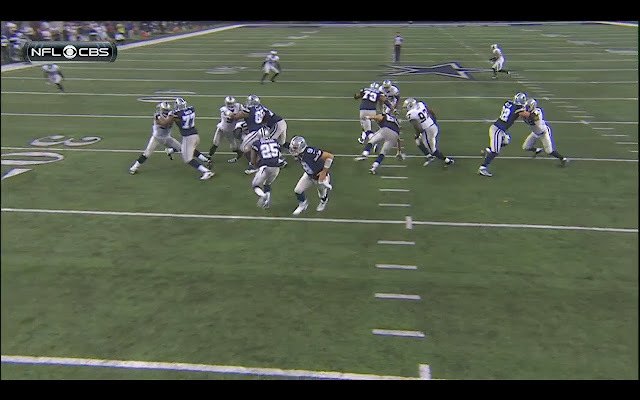 Leary has to be quick here, because the DT knows what is happening and is trying to beat him to the spot – but Leary cuts him off. Frederick and Bernadeau are doubling the other DT for now, and Free is ok. The LB on the play side thinks he sees a crease here, but 73-Bernadeau is going to cut him off. 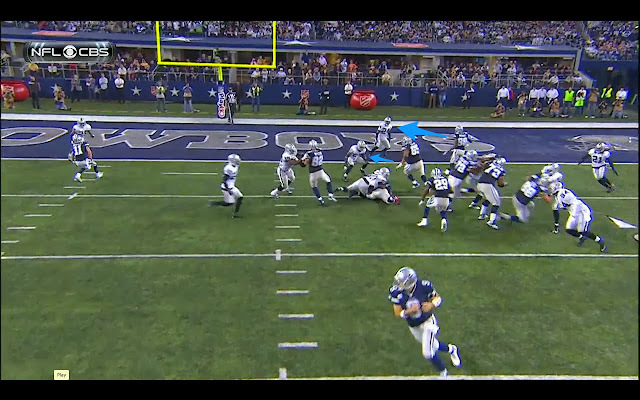 Above, see that LB peaking around the Free block? He is expecting Murray to bounce outside (like he always does) and Murray stays on course. 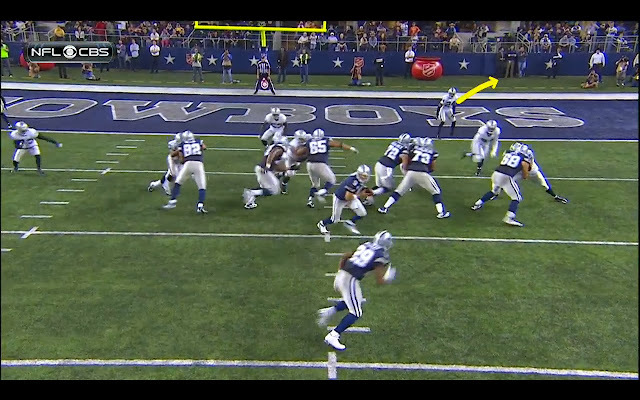 Leary now is free and is targeting the LB on the hash mark while Tyron is cutting down the DT and Witten has his guy on lockdown. Look at the wall to Murray’s right. Now Raiders are getting through, and with Leary and now Dez Bryant knocking out the last two defenders, this ball is headed for pay-dirt. The video below shows Leary dominating. And Dez digging out the safety. Well done. And you though the Cowboys couldn’t run the football. Here are the passing charts to see what was being accomplished on Sunday. Intern Tim has made some pleasing to the eye charts for us to see. Blue is a completion. Red is incomplete. Yellow is a touchdown, and Black is an interception. 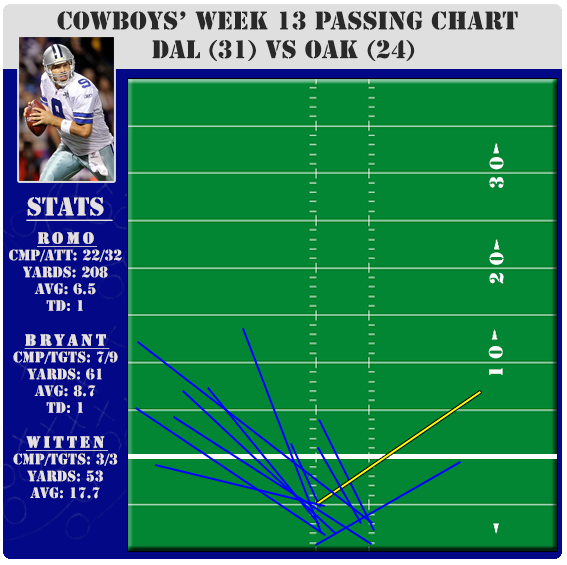 The passes are lines from where Romo released the pass to where the pass was caught. This shows you his release point and where he likes to throw when he slides in the pocket. * This statistic doesn’t count the 1-play kneel down drives. Shotgun snaps are fine on 3rd Down and in the 2 minute drill. But, we track this stat from week to week to make sure the Cowboys aren’t getting too lazy in using it. 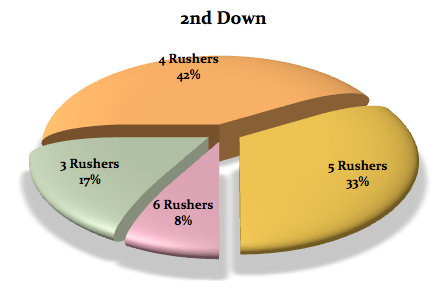 They are not efficient enough to run it as their base, and with a 15%/85% run/pass split across the league, there is no way the defense respects your running game. 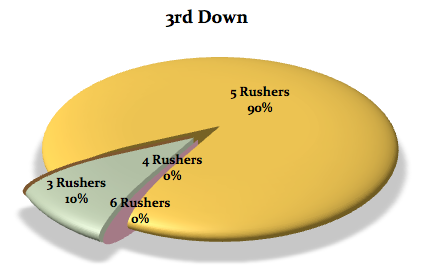 When shotgun totals are high, the Cowboys are generally behind, scared of their offensive line, or frustrated. As we look for trends that match up with Jason Garrett calling plays again, it would seem that the month from At Philly to At New Orleans, we see the Cowboys were in shotgun a stunning 70% of the time. In the 2 games that I suggest Garrett has grabbed the play-sheet, it is much more balanced – now at 53% which resembles Garrett from 2012 (54%) and not what Callahan has done this year (62%). And now, a look at the efficiency of each personnel grouping. Before you study the data below, I would recommend that if the numbers for the groupings are unfamiliar, that you spend some time reading a more expanded definition of the Personnel Groupings here. Below, see that they finally make sense. 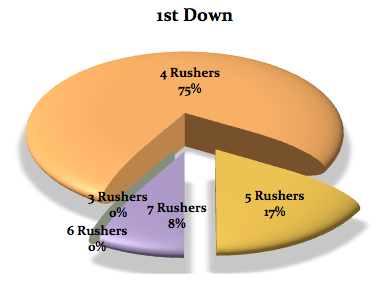 This is really how the offense was supposed to look when they left camp. Lots of multiple tight end looks, lots of 11 personnel. Lots of under center and still plenty of shotgun. It is almost like they decided to actually stick with a game-plan for 60 minutes. * – Knee Plays are not counted in play calls. I sort of admire Oakland’s thought process. They knew they were undermanned and they knew the Cowboys tendencies when getting frustrated offensively. 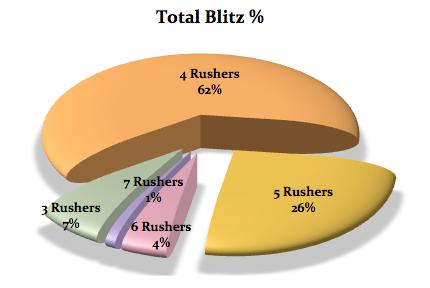 A blitz rate of nearly 50% screams that they agree with Jim Haslett-logic in dealing with the Cowboys offense. It was quite a lot to deal with, including a 3rd Down display that blitzed at a crazy 90% rate. Thanks to John Daigle and Tim Krajewski for their work on the charts and graphs. SUMMARY: Nothing comes easy, but now with a long break and a chance to play Josh McCown and Matt Flynn instead of Jay Cutler and Aaron Rodgers, we are starting to wonder if the Cowboys are going on around here. The offense is starting to look like they are discovering themselves and evolving into something where they are learning their personality or identity, and I have to tell you, this seems way more technically sound than the nonsense of 2011 and 2012 at this point in the schedule. They are mostly healthy and starting to feature more strategic options with their weapons. This means more Miles Austin/Terrence Williams 11 personnel than Gavin Escobar/James Hanna, but it doesn’t mean just going into shotgun and slinging it around and asking protection to hold up. It is balanced and effective and the last two weeks they have been able to put the defense in a bind at times. Again, we are not seeing 400 yard games very often, so there is still plenty of room for improvement, but there are almost no giveaway turnovers and there is some self-belief developing. With 4 weeks to play, Jason Garrett is starting to make sense of the offense and it is not a second too soon. Let’s see how it functions in Chicago, because it sure looks like they are going to need points and possession to get a result out of there and that hostile setting next Monday.